﻿I could have been 5 years old or 20. The drill was the same. Anytime we visited my grandma, my sister and I would sneak to the basement and look in the freezer. October through December was the optimal time for this search, but sometimes we would luck out, even in the summer. For any kid with a sweet tooth the freezer was a gold mine. In assorted Christmas tins would be spritz butter cookies, cordial cherries, candy Christmas trees, toffee, and peanut butter cups. She would give tins of candy and cookies to her neighbors, her hairdresser, and her friends. Whenever I do the same, I feel like it really is a family tradition. My grandma loved Christmas. Our stockings, embroidered by name, would be hung on the staircase. A tree with just animal ornaments would be in the kitchen picture window. There was a tree in the living room and the family room. Uncle Holly and Aunt Mistletoe figures would be hanging from the light fixtures. My memories of her house at Christmas are some of the most vivid ones I have of Christmas as a child. It was a sad Christmas Day in 2007 when she passed away. But after that year, the sadness returned to joy. She loved Christmas. Our joy in the holiday can only honor her life. My grandma was the only person I knew who made her own peanut butter cups. This recipe may not be the exact same, but it is pretty close. Get ready to spread your own Christmas cheer this year. Mix all filling ingredient together until smooth. You can chill for 15-30 minutes to make the filling easier to form into patties. Line a mini-muffin pan with festive holiday liners. My pan has 24 openings. Melt 1 cup of milk chocolate chips with 1 tablespoon of oil on low heat in the microwave until melted then stir until smooth. I melt 1 cup at a time just so that it doesn't cool while I'm working with it. With the PB filling above (and probably 2 bags of chocolate chips) I made about 36 cups. Once your chocolate is melted, spoon enough chocolate in the bottom of each muffin cup to cover the bottom. If you are feeling industrious, use a small decorating paint brush to brush some chocolate up on the side of the liners (about halfway up). Place mini-muffin tin in the fridge for the chocolate to set. It should only take 10 minutes or so. Take the peanut butter filling and shape into small flat-ish discs (how's that for a definition?). You don't want the peanut butter center to touch the edges of the muffin cups. Once the chocolate has set in the muffin cups, place a peanut "disc" into each muffin cup. 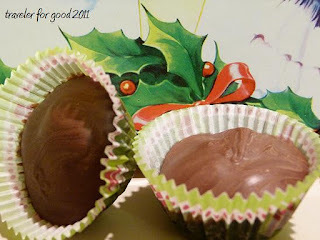 Top each cup with enough melted chocolate to cover the peanut butter completely and to get a smooth top (rather than a chocolate covered bump). Put the peanut butter cups back in the fridge until the chocolate sets. Store in a Christmas tin of your own. Goodwill sells them this time a year for under a dollar. Peanut butter cups freeze well and will be a special treat for your family when they scavenge in your freezer when you're not looking.